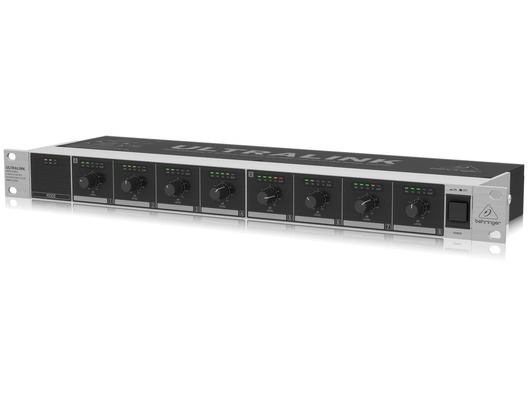 The Behringer DS2800 Distribution Splitter is a professional-quality splitter for various applications from studio recording to commercial settings such as shops and restaurants. It features 2 low-noise XLR line inputs and 8 channel outputs, plus 2 Link Output XLR sockets which allow you to build your system by connecting additional DS2800s. The dual operation modes mean that you can either send 2 audio signals to 4 different zones, or one signal to up to 8 different zones, and each of the outputs has its own LED meter which enables you to immediately detect signal presence and adjust sound levels with no distortion. This makes the DS2800 ideal both for monitoring sound in a studio setting and for tailoring each channel to clientele in a commercial scenario. In the recording studio, monitoring options are crucial for the performers as well as the engineers, so DS2800s 2-In / 4 Out mode makes it easy to switch between various loudspeaker and headphone systems. For applications such as restaurants and the like, running separate zones lets you set individual volume levels to better suit the needs of your clientele. The Mode selection switch is located on the rear panel and LED indicators on the front let you know which mode has been selected. DS2800s XLR line Inputs feature state-of-the-industry, ultra-low noise op-amps for the ultimate in pristine sonic performance. In addition to the inputs, Link Output XLR sockets are provided for cascading additional DS2800 devices, so your system can grow as needs change. All XLR Input and Output connectors are gold plated for the highest signal integrity.